I have a mug at work that I love. It’s from Starbucks and I got it a few years ago on valentine’s day. I wanted to make it into a cake…so I did. My greatest challenges were creating the well where the “coffee” goes and getting the handle to stay on. For the well, I carved a little out of the top of the cake before I covered it with fondant. 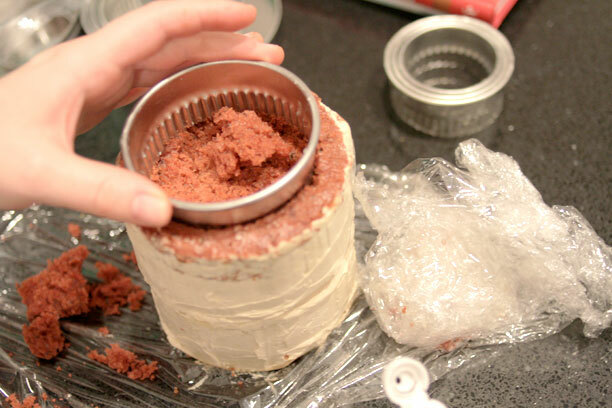 It made a little bit of a mess so I spent a lot of time brushing crumbs off the cake. 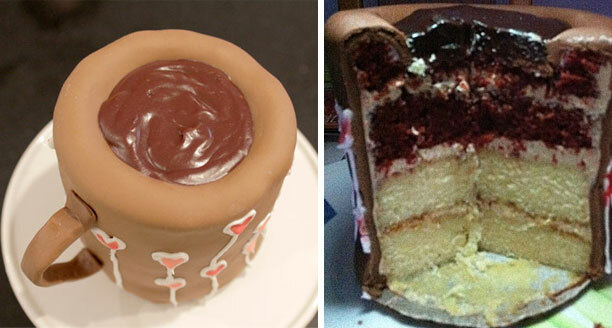 In retrospect, I probably should have cut the hole out of the top layer of cake before I even stacked the cake. Oh well! Next, the handle. That was tough. What I ultimately did was create a flat piece of fondant mixed with gumpaste and shaped it sideways on the counter. I let it “dry” as much as possible on a rolled up piece of plastic wrap. After sitting overnight it was firm enough to hold it’s shape. I attached it with some sugar glue and supported it from the bottom with the plastic wrap. It held for a while but didn’t make it through transport. The cake is 2 layers of butter cake with 2 layers of red velvet with mocha buttercream. 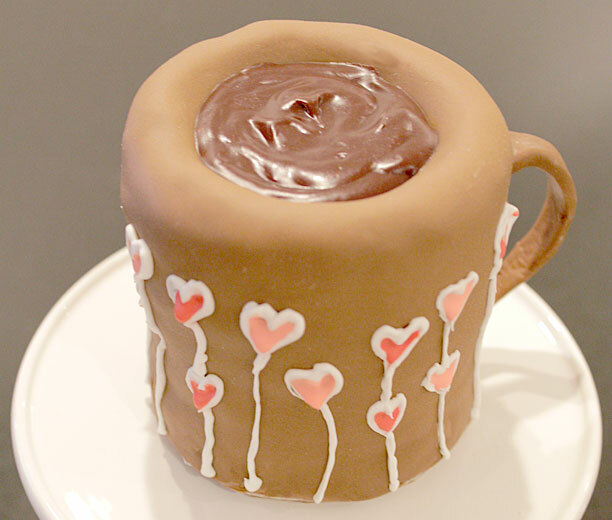 It’s covered in a mocha fondant and topped off with some chocolate ganache “coffee”. It tasted delicious! You are SO freaking talented Marissa! I love to see this – great work! Whoa, so I saw your project on Kickstarter and decided to check out the blog. I’m not a big cake person but this one is crazy cool! 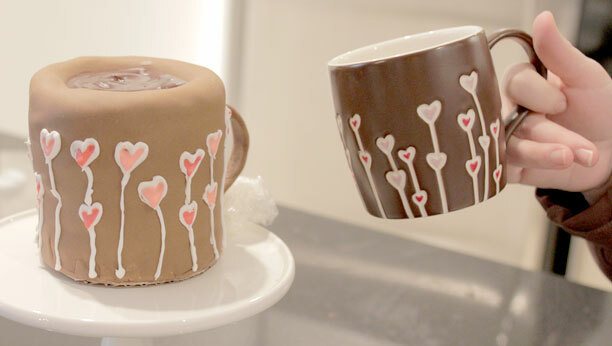 Love the real mug conversion to a cake. It looks delicious too! Great work.